Unless you live near the ocean, chances are you don’t do a lot of offshore fishing. If you’re from a place like Iowa or Nebraska, you’re probably used to fishing in local ponds, streams and rivers. That said, every once in a while it’s nice to take a trip south to a resort area for a vacation, right? Moreover, when you’re in a place like Cabo San Lucas, Mexico, there’s the unique opportunity to do some fun offshore fishing. What are some benefits of offshore fishing? For starters, you get a wider variety of fish. Imagine pulling in a fish you’ve never seen before! It’s quite a thrill. Typically, trout, flounder and redfish stick close to shore. But what lurks under water, out to sea? How about sharks, swordfish and big tuna? Serious game fishers prefer offshore fishing for the variety. Think of the pictures you’ll take of yourself and the “big one” you caught. Next, think about where you normally fish. It can get crowded. You’ve got too much competition. But out on the open ocean waters you’re in a non-competitive setting. The “private” feel of fishing offshore, miles from land, appeals to many anglers who like to be literally miles away from others. Out on the ocean, in a well-equipped fishing boat, you’re going to have the most incredible views– the kind you just can’t get from shore. Maybe you’ll see dolphins, seals or whales in their natural habitat. Birds will fly by. Imagine a sunset on the ocean! It’s just an incredible place to fish. 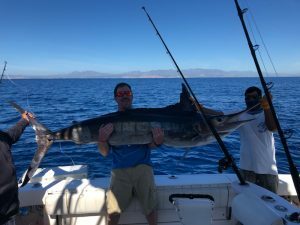 Guerita Sportfishing is who you need to call when you decide to take that offshore fishing trip in Cabo San Lucas, Mexico. Fishing the Sea of Cortez or the Pacific side of Los Cabos are both great options. Some fish you might expect to catch include marlin, tuna, dorado, wahoo, and sailfish. Please visit the reserve page or email info@gueritasportfishing.com for more information and to plan your trip.